Well, as you will probably have realised, yesterday became kind of complicated as news came in from Thailand. And so later as I was watching those surreal scenes on the television, and shedding a tear, and hugging Lookchin, we decided that even in such times – especially in such times – we must carry on as best we can. 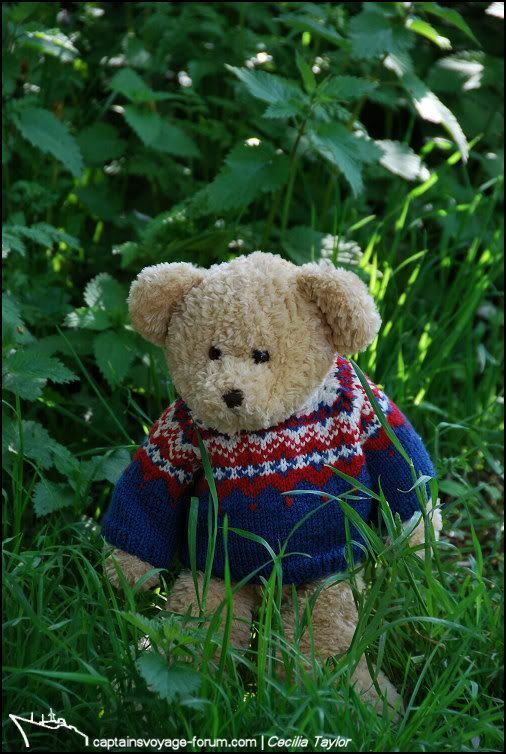 So Lookchin hopes that you will understand, and is going to try to bring us all a much needed smile with his little accounts of his vacation adventures, just as he had always intended. Aunt C has been so very kind to me. We have been talking about Central World where I came from, and that has helped. Now I will try to tell you about my vacation ‘cos I don’t want to you be sad all the time pakarang. I have already made a new bear-friend here. 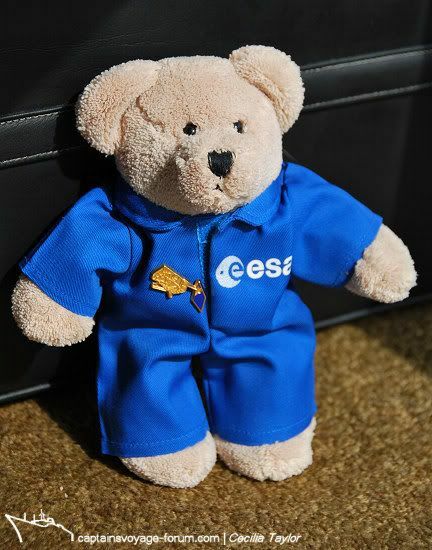 His name is Esoc-Bear, and he originally came from Darmstadt in Germany where he worked at the European Space Agency. He has connections with the weather satellite HQ there too, and showed me his pin badge of a polar orbiting satellite which he is wearing in this photo I took (with some help from Aunt C who wasn’t sure if I was allowed to use a Nikon camera!). 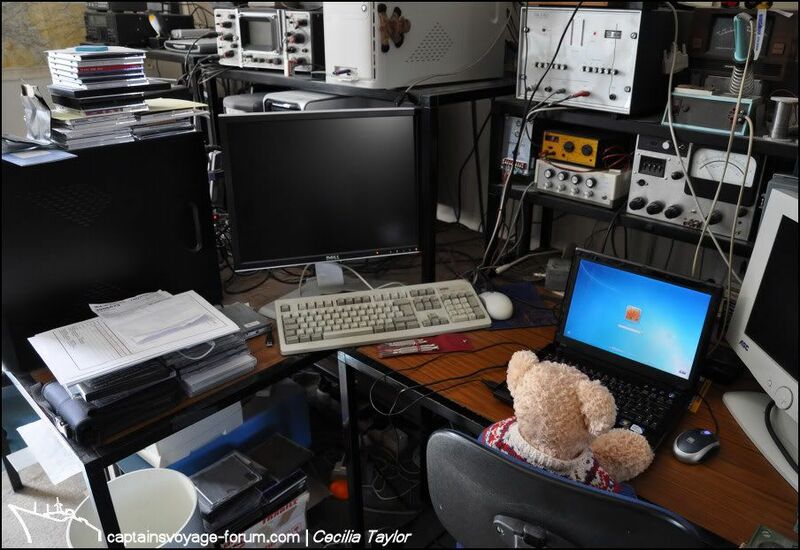 It is good to have such a technical friend. He told me about pc’s and Microsoft Windows too! Here I am about to log on to a portable computer, but then D came in and said I have to play in another room. (He looks like Neptune which is a bit scary, so I did as I was told). Have fun with Aunty C, Lookchin!!! . . . . and here I can hardly hear myself think! Better let him have a turn on the computer while I go get some more coffee . . . I have been having a WONDERFUL time! After reading the CVF thread How fast is your Internet connection? 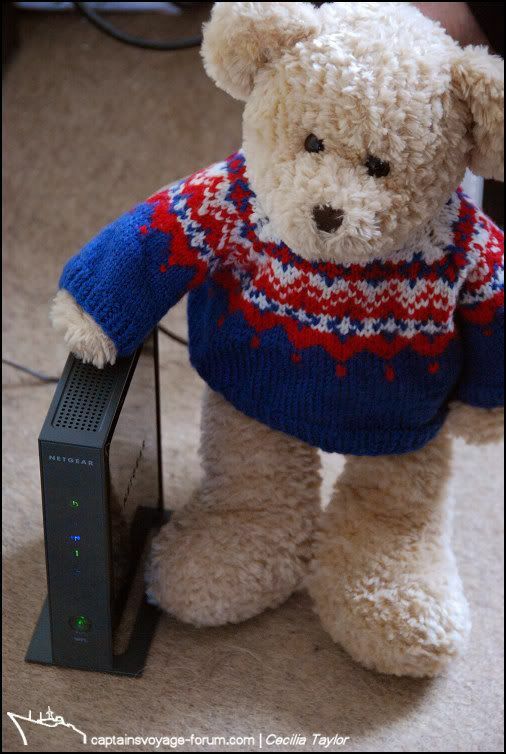 I noticed that Aunt C had reported a slower download speed because of being on the wireless network, so Esoc and I decided to try to improve the situation. Here I am helping to install some new equipment. Now I measured 19.60 Mb/s download speed instead of the around 6.0 figure she was getting before! Last edited by Seagull; May 21st, 2010, 22:01. Ummm, I have a distinct feeling that Lookchin thinks that because he “helped” with improving the wireless network “for me”, I will be so grateful that as a thank you I will let him have his own way. Allow him to play on the computer whenever he wants, for example. Actually I think he probably plays on the computer back in Trondheim whenever pakarang is away on night shifts. It’s the only explanation of why there are a lot of threads on CaptainsVoyage which he seems very familiar with. I realised this when he was looking out of the window and suddenly became very excited. 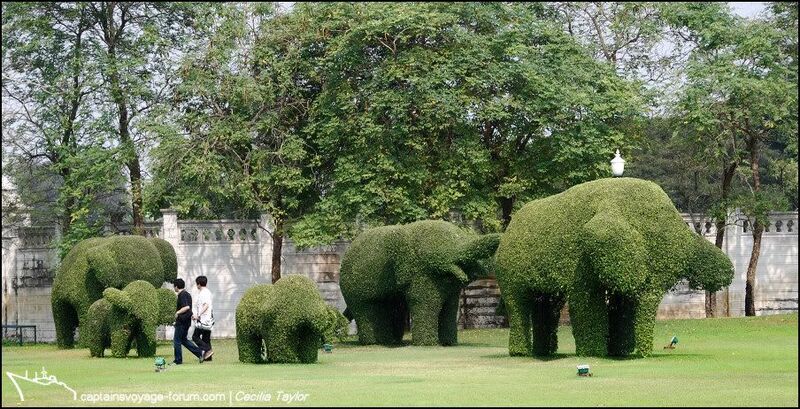 “Look, look, there’s the hedge”, he exclaimed. “I’ve seen the hedge, I’ve seen the hedge, I’ve . . . . “ – and he was outside, still shouting at the top of his voice, before I managed to work out what all the fuss was about. 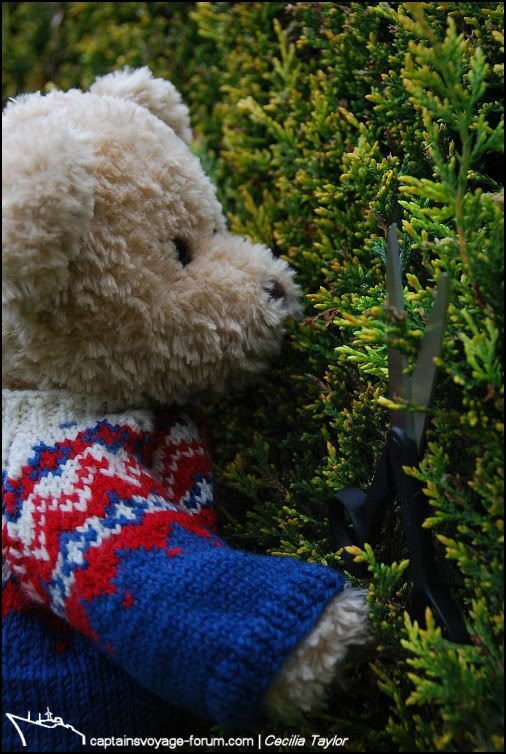 Well, there was Lookchin climbing up that very same hedge, and as if that wasn’t mischievous enough, he had a pair of scissors with which he appeared to be trying to cut it! I patiently explained in an Auntie kind of way that the hedge was actually growing in the garden of the adjacent house, and that the neighbour came round to cut it whenever necessary, so there was absolutely no need to attempt to trim it without the proper tools. Snip, snip, snip . . . .there was just no stopping Lookchin. The garden is now out of bounds, and as he has become so active all of a sudden, I intend to take him on an energetic walk soon. The nearby hill has featured in Skyscape, so he might actually fancy the idea! 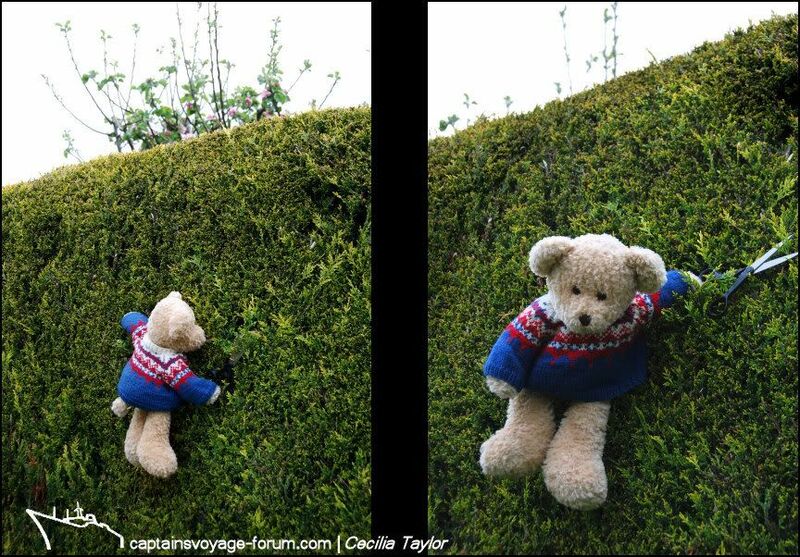 He did look adorable up in the hedge though (but don’t tell him I said that!). Great seeing that he has a fabulous vacation, and that he gets to work for his living as well (not only play). Well no doubt if he had been home these last couple of weeks, he would have been stripping down Rolf's engine, insisting that he knew what he was doing, and that he would have it fixed in a jiffy! Thank goodness he was at another location... I had not thought about that before you mentioned it... it could have gotten a lot more expensive than it already was! All you have to do is hug him from time to time . . . and make him a day in your 365!
. . . if he reads this he’ll be expecting pocket money next!!!!!! Auntie C must love me ever so much ‘cos she said we could go a walk together, even after saying earlier how busy she was going to be all day. But she was a bit fussy about me having to be carried down the road because of the traffic and suchlike. I told her I was used to the traffic in Bangkok, but she still insisted on carrying me. I was very glad when we reached the path and I could run ahead on my own. Trouble was I soon reached a point where the path went two ways and I didn’t know which way to go. Had to hang about waiting for Auntie C. When she eventually caught up she thought this was amusing and insisted on taking a photo of me looking confused. Oh no, Auntie C is fussing again!!!! I don’t know what she is on about at all – something to do with stinging nettles. Made it sound like they were a kind of plant that attacks people. 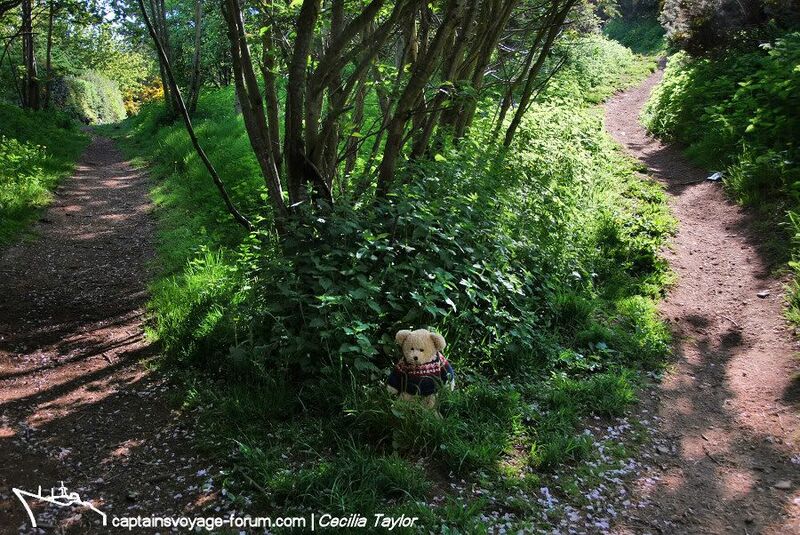 As if that would be any problem to a bear who has explored the tropical jungle!